Shock news from 'Forecast the Facts' – "HadCRUT is not peer reviewed" | Watts Up With That? I’m sure Phil Jones will need to be notified right away that this paper on HadCRUT4 was never actually published. While some people might agree, I don’t think it means what she thinks it means. How embarrassing. These are the sorts of low information activists that are bullying weathercasters and TV meteorologists into saying what the activists want them to say about climate. Be sure to tell you own local TV weathercaster or meteorologist to watch out for these folks, since they are obviously clueless. *blinks* Okay, I’m instantly lost. MoveOn.org is anti-HadCRUT ? And earlier today, David Suzuki declared himself to be anti-immigration. Did something cosmic happen today that I missed? I really don’t understand why you give exposure to irrational idiots like this. I suppose someone has to say it. Emily sounds like a real twit. What a fool. Glad she’s on THEIR side, lol. @007 because if I don’t nobody will know just how irrational these idiots are. > I really don’t understand why you give exposure to irrational idiots like this. It’s not exposure, it’s documentation and ensuring that what you say on the ‘net lives forever. Aw, come ON, Bond, James Bond (007 above) — that’s easy! Okay, let’s see if Ric Werme and I post at the same time again…. Maybe things have changed since she graduated, but Connecticut College seems to have a degree in “Environmental Studies,” not “Environmental Science.” Minor technicality in name, but it helps to get your major right when you’re trying to use it in an argument. Her cluelessness regarding HadCRUT is quite amusing. I like how she found the means to attack it thanks to “I googled HadCRUT” and a write-up from SkepitcalScience. Should they rename it to PushOver.org? “These are the sorts of low information activists that are bullying weathercasters and TV meteorologists into saying what the activists want them to say about climate. Aren’t you s’posed to know your enemy? We agree with her conclusion. We are ridiculing the irony of her saying it. And sneering at her abysmal ignorance of the meaning of what comes out of her mouth. I think she has gotten datasets confused. We know that after all the adjustments and manipulations it is GISS that is bunk science. Conn College’s program actually has two different tracks: (1) natural science and (2) social science. The natural science track has two different stat courses as math options. The general ed requirements require either a 100-level comp sci class, a 100- or 200-level math class, a philosophy class, or a 12X frosh seminar class (currently limited to “robotics and problem solving”). It appears that you can get a 4-yr environmental studies degree without taking a single math class (unless possibly one is a pre-requisite for a required class). Based on her educational and career background I’d say she’s chosen to marinate in deep stupid all her adult life and her ‘climate studies’ program was a couple years of crackpot catechism. Those who can, do. Those who can’t, become Community Organizers for MoveOn, Green Corps. and O for A? With an added splash of “do as I say and not as I do” for good measure? Question, do you think she took the Natural Science or the Social Science Track in Environmental Studies at Connecticut College? Plus, do you think it was the Major or the Minor route..
Hey, I studied Physics in tech. school, that doesn’t make me a Professor in Physics. But I once stayed in a Holiday Inn, does that count? And after all that Phil Jones could do, HadCRUT 4 is going down. Down, down, down. You know, “down”, as in “not up”. It’s almost like CO2 doesn’t matter much. This cooling thing, what is causing it Mr IPCC? Could it be you are wrong? Could it be we don’t need to be inflicted with $trillions in tax servitude for a lie? HadCRUT4 was fabricated for one reason: because version 3 didn’t show sufficient global warming: see the difference? What got her going? Did a Skeptic quote the HADcrut data? And did she need a quick way to refute their argument? After rolling around laughing at Tisdale’s comment, “Let there be crackpots,” I sat back and thought about all the dumb mistakes I myself have made, in my time. Mercy and pity crept into my thoughts. When in my teens I used to be a sidekick for some of the most dangerous “father figures” you can imagine. (Sort of like the the little yappy dog prancing along beside the big bulldog “Spike” in old Warner Brothers cartoons.) They advised me to do dumb things and take dumb stands, and I did what they said, seeking approval. Perhaps “Moveon.org is the “Spike,” and this person is the little sidekick. The real test is: Can this person learn? 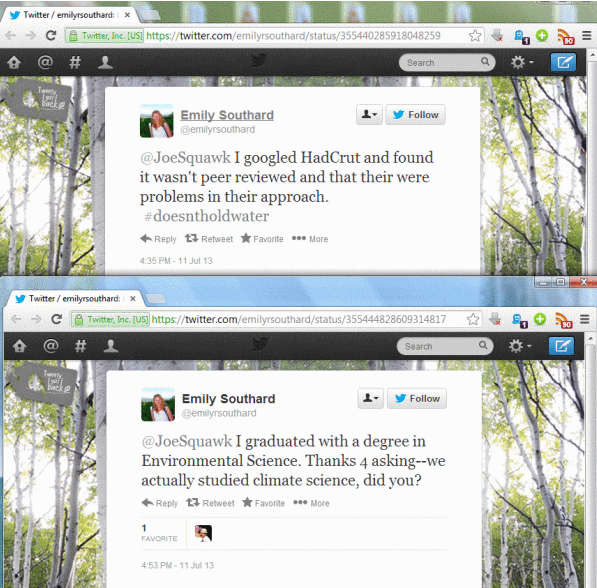 Guessing she had to find a way to “disprove” the “world hasn’t warmed since ____ according to HadCRUT” claim. Does not truth and fact trump the other option eventually? @JoeSquawk is Joe Kernen, who is one of the co-hosts of CNBC’s early morning show Squawk Box. He has had the temerity recently to express skepticism about AGW on air. The Moveon crowd has targeted him for their “isolate and ridicule” approach. “Pick the target, freeze it, personalize it, and polarize it.” Hang in there Joe. Mating season for social media Twits means navigating by IFR– not aviation’s Instrument Flight Rules but those of Move.On’s Invisible Flying Rabbits. It is well known that if a academic discipline has the word “science” as part of its name, then it is *NOT* a science. Those are the disciplines that suffer from “science envy,” wishing for, but never achieving the rigor, trustworthiness, and cachet of actual science. For example: political science, social science, climate science, environmental science, etc. Indeed, if one replaces the word “science” with the word “advocacy” the names become accurate: political advocacy, social advocacy, climate advocacy, environmental advocacy, etc. Disciplines that are actually sciences have names like: physics, chemistry, biology, ecology, medicine, limnology, astronomy, geology, etc. While the absence of the word “science” in the name does not guarantee that the discipline reliably practices science (e.g. astrology, economics), the presence of the word “science” in the name is a guarantee that the discipline does not reliably practice science. Whatever it is that she did study, it does not seem to have included studying the difference between “there” and “their”. Your can get an Environmental Studies degree for $58,780/year. The science option for the degree may produce graduates that are trainable. I’m not sure about the social science option. Most of the course description is touchy-feely stuff with no backbone. The degree and course descriptions don’t sound very promising for anything but turning out environmental activists. This young lady sounds like she did well in saving the planet and wasn’t around much that gave her any science or engineering tools to do that. I’ve hired a number of environmental degree types over the years. The good ones only take a year or so of intense training to be useful. I don’t think this young lady would do well in the “real” environmental world. Dear Emily fills the role described below. The most dangerous people in the world, are people who “mean well” (do gooders). Unfortunately they have no concept of “The Law of Unintended Consequences”. This law says that well meaning actions, not thought through, can have quite different and disastrous consequences. Emilys’ CV makes her perfect for the role. I firmly believe that a lack of immediate negative consequences for foolish actions have developed this lack of common sense evident in so many. It is well known that if a academic discipline has the word “science” as part of its name, then it is *NOT* a science. This is the tweet that makes me mad “@JoeSquawk and if ur not part of the solution or accurate reporting, @CNBC should reconsider your employment.” Typical Alinsky tactics just like GeneDoc said. As the holder of an MBA along with a PhD in another field, I must differ with the thought that business is a worthless subject. Because business fails quickly if it falls for the sort of irrationality that is killing science and the humanities, theories analogous to CAGW don’t hold up for very long, because their proponents soon crash and burn. That is at least some constraint on academic madness. In business, you have to get it right or you’re out of business (crony capitalists, like der Fuehrer’s bedmates, may look like they are “getting it right,” but fraud and larceny are not business but an entirely different kind of discipline). Give her an “F” for reading comprehension. That she had to Google what HadCRUT was is indeed precious. That she thought it was some crazy denier idea was also precious. Yeah, ‘Environmental Science/Climate Science’… “scientists all agree this is warming, and warming at an alarming rate, so let’s talk about how to solve this”, “here’s how CO2 warms, with this handy dandy PowerPoint explaining it”. Read peer reviewed papers that disagree? Review said papers? No. Take a math class or stats 100 class? Maybe. Apply statistical methods to data in her field? No. She probably just did problem sets and take a final. Welcome to LAS undergrad. Well, the syllogism she is using must be pretty simple. 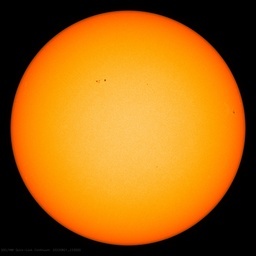 Peer reviewed consensus science indicates dangerous warming. HadCRUT 4 does not show significant warming for the last 16 years. Therefore HadCRUT 4 is not peer reviewed. Including one more premise, namely “HadCRUT 4 is peer reviewed” only makes the whole damned logical construct inconsistent, what is good for nothing but feeding the merchants of doubt. Facts should never be checked anyway, but forecasted. Sounds good? As somebody who has a Computer Science degree I would have to disagree. There was a maths requirement but not a statistics one. Laboratory and experimental work didn’t exist – it was writing code. There is no form of observational measurement, analysis and conclusions to be drawn. Perhaps a big list of climate related studies which are not really peer reviewed ie: where studies get special treatment due to journal members adding their names to dodgy studies to get them published, ‘communicated’ papers, ‘pal review’ where sympathetic journal members shepherd papers into publication by using sympathetic reviewers, etc. Some so called studies should never have been published, and would never have made it without ‘special treatment’ from unethical helpers. Friendly Fire. Warmunist movement in chaos. Lack of warming showing in their own datasets leads to collateral damage. The general is gone. Carry on warmunists. Maybe in your computer science degree. Not in this case. If they have no competing agenda and a few brain cells to rub together they would probably end up as skeptics if they read and study those sites. That is why we have loony lew and co. cooking up idiotic studies showing skeptics are nuts. Much much better to tell your adoring disciples we are dens of inequity, post a few twisted out of recognition tidbits from the sites to trash at their paid for sites and then feed them talking points to spew in the General Propaganda Outlets MSM. Remember the whole idea is to CONTROL information so the general population is ignorant and unthinking. ….then it pretty much stays at laughing to be honest if this is the kind of razor sharp intellect we’re up against. I’m still getting my head around the fact that Greenpeace were so willingly lackadaisical with the facts yesterday that they willingly lied to all of their would be supporters regarding the design inspiration behind the Shard – and worse, a lie so easily checked within 10 seconds on Google. Typical. If something doesn’t agree with the “facts” that you “know”, it must therefore be a big-oil funded lie. Wasn’t moveon created to keep George W. Bush from winning a second term? Isn’t their entire reason to exist moot? Can you imagine actually telling anyone you’re associated with moveon? To quote Bill Engvall, it’s a good thing you can’t actually die from embarrassment… there’d be teenage girls dying every time they were in public with their dads. And to bring the rant full circle, I don’t have a degree, and am constantly having to explain everything, from the most basic to the most complex, about computers and programming to twits with degrees. True story: I once had to explain the concept of a “for” loop in C to a 20-something that had a degree in programming… sigh. I encountered a UK version of this the other day on FB – I replied to a FB friend’s image of the flowers in her garden with a reamark about how backward everything is this year where i live. This total imbecile claiming to be a full time climate activist chimed in with a post about AGW and how he is saving the world. A few exhanges later, he was ranting at me about Holocaust Deniers, how ashamed I should be not be helping save the planet by destroying carbon, and parroting a load of ReaClimate rubbish about my conformation bias, in response to my measured remarks about flatlining temps and advice to study the work of Bob Tisdale, Lief Svalgaard, Piers Corbyn, Steve McIntyre, Jo Nova etc etc. He clearly had no comprehension of scientific method, maths, statistics etc etc – and no wish to learn any. This is sadly the kind of person being churned out by our educations systems: full of prosletiszing zeal and bereft of basic knowledge or ability to reason from eveidence.. The fact I spent my life as a professional researcher who would have been out of business without the ability to find and evaluate accurate material, and that I’d been studying the climate / Agw dispute in depth for at least 12 years, meant nothing to him. And that is enough to really frighten you when you consider they all vote as adults when organized, shepherded and paid by Community Organizers that is. What? You didn’t realize the whole goal for Community Organizers is to use those people as political weapons? Just look at what is happening in Florida RIGHT NOW. The Organizer and Chief has sent the US Justice Department off to ORGANIZE PROTESTS concerning the ongoing Zimmerman trial. I kid you not. JW filed a Freedom of Information Act (FOIA) request with the DOJ on April 24, 2012; 125 pages were received on May 30, 2012. JW administratively appealed the request on June 5, 2012, and received 222 pages more on March 6, 2013. According to the documents:…..
As the holder of an MBA along with a PhD in another field, I must differ with the thought that business is a worthless subject. Because business fails quickly if it falls for the sort of irrationality that is killing science and the humanities, theories analogous to CAGW…. This may be rather childish, but I can never read HadCrut without thinking it would be better named HatCrud, thus indicating in one fell swoop the place from which they are speaking and the quality of the data. As a product of Connecticut College, Emily is also an advertisement for this institution of lowest learning. How many parents will NOT to send their children to Connecticut College? I blame Mountaineer Montessori, screw ’em up early and get their cash. There are days I could argue it’s a Black Art. And that my computer is out to get me. > As somebody who has a Computer Science degree I would have to disagree [that it is a science]. There was a maths requirement but not a statistics one. Laboratory and experimental work didn’t exist – it was writing code. There is no form of observational measurement, analysis and conclusions to be drawn. One reason I’m a software engineer instead of a computer scientist is that I preferred creating systems to the heavy theoretical slant of the computer science dept. (This was back when CMU had only a graduate CS degree.) Perhaps undergraduate programs spend more time writing code, but a lot of the graduate programs dealt with recursive function theory, optimizing compilers, and in general inventing the tools that engineers used to build things like the ARPAnet. But Darwin isn’t (helpless). It’s just evolution in action (Larry Niven in Oath of Fealty). And perhaps that is exactly what the gods had in mind. On another note, how about MoveOver.org? Besides demonstrating her complete incompetence, she does raise an interesting dilemma. hadCrut is SUPPOSED to be raw data. Since when does RAW data need peer review? And who is the peer that reviews it? God? Gaia? Mother Nature? I think you are over estimating it. I am not sure they are up to 12th grade 1945. Even more stunning is Emily’s Connecticut College environmental science degree contrasted with Kernen’s University of Colorado molecular biology degree + masters from MIT + cancer research papers published in Cell, Developmental Biology and the renowned Cold Spring Harbor Symposia. Just who is the informed person here? I do agree with Chad and I mostly agree with you about the Harvard Business grads. Frankly, anyone who brings in an inexperienced business grad and lets them make unchecked un-validated decisions that damage the business deserves their end. Just the back slope of the business paradigm in action and everyone involved should make sure the blame follows the decision makers. I will confess, for several years I was pursuing a business finance degree at Wharton. That is before my company’s finance department brought me in to work on their spanking new PCs; like the original IBM with attached 10mb hard drive cabinet. Back in those days, computers were under the finance department in many businesses. A ‘computer science’ degree didn’t exist then in my local colleges; one majored in an accepted degree and built up a portfolio of additional ‘computer’ credits, usually in languages and ‘system’ or ‘program’ development. My first run in with a ‘computer science’ degreed employee was a lark and I had great fun. First off, when it’s spelled as pronounced: Hauwvud. Second, please don’t swear on WUWT. Hmm. I think it depends on the university. There are university that offer Computer Science, and Computer Engineering and Software Engineering as separate degree tracks. The first is heavy heavy theoretical work. The second is practical application of theory (what goes into building efficient systems) and the third is coding. I’ve known CS grads who have only taken a few programming courses, because they are not studying to be coders. Sad to think how many students hitched their “major” unto a business bubble using government and science to create and increase profits. I don’t get it – usually Montessori schools are pretty good. All non-sciences have the word ‘science’ in their title. No true sciences have the word ‘science’ in their title. Great line but I’m afraid the crackedpots came after The Fall. Shouldn’t that be “Forget the Facts”? No, “Fake the Facts”. Or “Forecasts instead of Facts”. Or “Forecasts Fudging Facts”. Phantasy-land. One can forecast with a negative skill value. We’ve seen it in climate science. Good one Tim, well both of them; though the first one had me flashing back to Cliff Robertson in PT 109 not President Kennedy in one of his speeches. HadCRUt is bunk science. But not the way she means . . .
Suzuki’s anti-immigration rant is consistent with his underlying ideology, which preaches fixed-pie economis and drive-to-the-bottom ethics, but is another example of his increasing desperation as people are not responding enough to suit him. Suzuki and spouse sit on their large Gulf Islands property despairing that, with forays to their expensive real estate in the Kitsilano area of Vancouver BC. The reason people from poor countries emigrate is lack of freedom. Fix the political systems and those areas would not be poor anymore. But Suzuki does not actually want freedom, as he is effectively a Marxist (read his articles and speeches, including to the one-percent mob in Vancouver BC). His rants remind me of what civil rights activist Bob Friedland said about leftist political activists (see http://www.keithsketchley.com/newleft.htm, top of page).